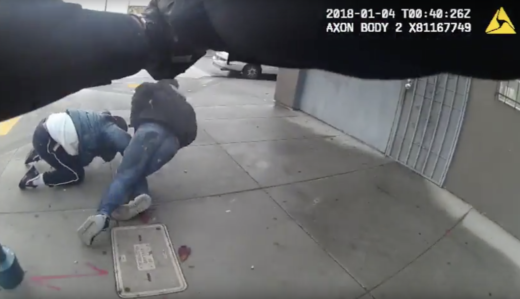 The Alameda County District Attorney's Office announced Tuesday it will not pursue criminal charges against a BART officer who shot and killed 28-year-old Sahleem Tindle near the West Oakland BART station in January. The fatal confrontation occurred when Officer Joseph Mateu intervened in an altercation outside the station during which Tindle had shot another man. In a letter to BART Police Chief Carlos Rojas, District Attorney Nancy O'Malley said she had reviewed report findings conducted by her office and agreed "that the evidence does not justify criminal charges" against Mateu. In February, BART released body camera video of the Jan. 3 incident. The video depicts Mateu, responding to apparent gunshots and panicked BART patrons, dashing from the station to the corner of Seventh and Chester streets, where two men were struggling over a gun on the sidewalk. Mateu issued a radio call of "shots fired" and shouted repeatedly for both men to show their hands. Neither man obeyed, and Mateu opened fire on Tindle, hitting him three times from an apparent distance of less than 10 feet. BART police said at the time that Mateu opened fire after he saw a pistol in Tindle's hands. The district attorney's 47-page report recounts that version of events but says Mateu opened fire after losing sight of the gun. Fearing that Tindle had gained possession of the weapon and could be about to shoot the other man on the sidewalk or turn the weapon on Mateu himself, the officer "fired three rapid shots into Mr. Tindle’s back." "Officer Mateu said that, after he fired the shots, he saw the gun fall out of Mr. Tindle’s right hand and the magazine fall out of the gun," the report says. "Mr. Tindle fell to the ground. Once on the ground, Mr. Tindle raised his hands up," as did the other man. The report concludes: "The analysis of this investigation includes consideration of whether it was reasonable for Officer Mateu to act when he did, rather than waiting to see if Mr. Tindle would eventually comply with the officer’s commands, drop the gun, and show both of his hands. The incident developed rapidly. Once Officer Mateu realized that a shooting had already taken place, it was not unreasonable for him to believe that further shooting could be imminent. This required Officer Mateu to make rapid decisions in a dangerous situation." The district attorney's report also includes summaries of interviews with witnesses to the incident. Several of them suggested that the fight that led to the fatal shooting may have started with a dispute over a pair of athletic shoes. A legal claim filed Feb. 13 against BART by the mother and two young children of Sahleem Tindle acknowledged that he had shot another man in the leg just before he was killed. But the claim said Tindle had been struggling with the other man and had been disarmed by the time Mateu arrived on the scene. The claim cited the video from Mateu's body camera. John Burris, an attorney who represents the Tindle family, said in an interview Tuesday that there was no conclusive proof the shooting was justified. "It seems to me the officer was clearly negligent in his having shot this particular person without having evidence that he in fact was in fact committing a crime," Burris said. "There were two people struggling over a gun it looks like," Burris said. "You couldn’t tell who had possession. But at the time the shooting took place commands had been given and it appears that [Mr. Tindle] was trying to comply. The officer interpreted his effort at complying with an act that suggests he was about to do something differently." Burris also said he was not surprised by the decision of the DA's office. "On balance I’m not surprised at the decision," Burris said. "I thought the DA worked very, very hard to support the police officer’s position, unjustifiably so. There should be criminal prosecution here if nothing else for negligence." Burris said Tuesday the civil case is currently in federal court and "we're moving forward." This post includes reporting by KQED's Peter Jon Shuler.